In stock. Order in the next 6 hours, 3 minutes and it will go out today! 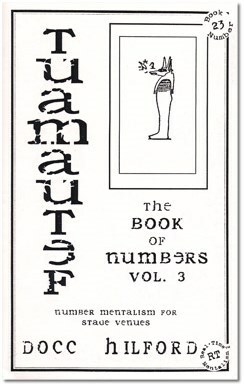 Professionals and amateurs alike have been wildly enthusiastic about the first two volumes of The Book of Numbers. Here is the final Volume, devoted to stage mentalism. Each routine can easily fit into any program. This book has routines for those who want to perform professional mentalism without specially made props or restrictive conditions. Most of these performance pieces use little more than a few envelopes, paper, pencils and a borrowed phone book. Flare Optico - Three people take arithmetic flash cards from a stack, each containing a different problem in addition. Even though the flash cards are hidden, the mentalist reveals the total from each problem. For an added climax, he reveals all the numbers in the problem. Dolce Libra - A spectator holds a phone book behind his back and chooses a page. He brings it around in front and reads a name on the chosen page. The mentalist reveals the chosen name and number! It's simple, but oh so clean. Any borrowed phone book is used. The spectator has an apparent free choice. You never have to see anything. No cues or glimpses. Special Delivery - Two spectators help the mentalist write a dozen or so names on billets. Someone randomly chooses one of the folded papers. A spectator seals it in an envelope. Although the people in the audience are unknown to him, the performer is able to deliver the sealed envelope to the person in the audience whose name was randomly selected! 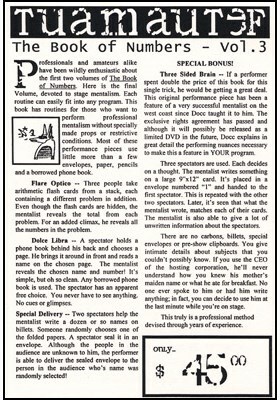 Three Sided Brain - If a performer spent double the price of this book for this single trick, he would be getting a great deal. This original performance piece has been a feature of a very successful mentalist on the west coast since Docc taught it to him. The exclusive rights agreement has passed and although it will possibly be released as a limited DVD in the future, Docc explains in great detail the performing nuances necessary to make this a feature in YOUR program. Three spectators are used. Each decides on a thought. The mentalist writes something on a large 9" x 12" card. It's placed in an envelope numbered "1" and handed to the first spectator. This is repeated with the other two spectators. Later, it's seen that what the mentalist wrote matches each of their cards. The mentalist is also able to give a lot of unwritten information about the spectators. There are no carbons, billets, special envelopes or pre-show clipboards. You give intimate details about subjects that you couldn't possibly know. If you use the CEO of the hosting corporation, he'll never understand how you knew his mother's maiden name or what he ate for breakfast. No one ever spoke to him or had him write anything; in fact, you can decide to use him at the last minute while you're on stage. This truly is a professional method devised through years of experience.